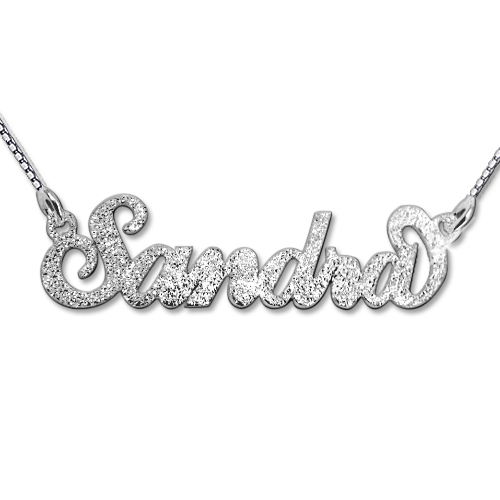 Personalized Diamond Cut Sparkle Sterling Silver Hollywood Style Double Thick Name Necklace. Imagine having your name personalize in a Hollywood “Carrie” style name pendant with the your name or word. It made of real Sterling silver (0.925) & Rolo chain. This necklace is perfect for name or a word over 8 letters and can handle more letters. This is the perfect gift for any one or any occasion; and the perfect way to express. This is the best gift to gift to impress any one. Height of pendant: 6-8mm 0.2" - 0.3"